Star Wars Rebels Season 1 has premiered on Blu-ray, and it’s well worth the wait! Packed with extras, as well as 15 episodes from Season 1, both newcomers to the series, as well as fans since the beginning, will be very happy with this DVD set. The show is fantastic, and amongst the best that Star Wars has to offer. 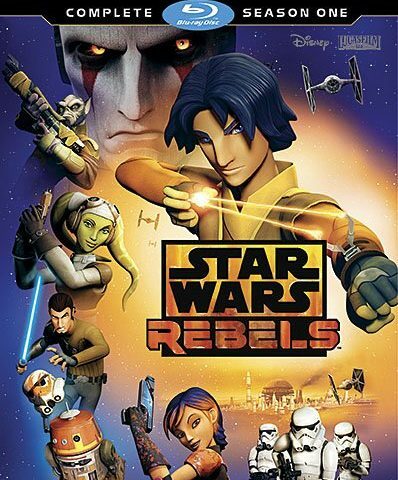 If you have never seen Rebels, the first season is relatively short, and extremely accessible to newcomers. The voice cast (Freddie Prinze Jr., Vanessa Marshall, Taylor Gray, Steve Blum, and Tiya Sircar) are stellar, and embody these roles to perfection. Rebels Infiltrate Star Wars Celebration: This is the feature that I was most excited about. There are plenty of video snapshot moments from the amazing convention last April, and if you look closely, you will see many members of the Star Wars fan community. Seeing the cast up close and personal on stage during the Rebels panel is great, as you get to see their reactions to the Season 2 trailer. It’s a great trip down memory lane, as well as a nice revelation into the Celebration experience. I wish it were longer, but that’s primarily because the event was so much fun. Star Wars Rebels: The Ultimate Guide: This 22 minute feature is narrated by Freddie Prinze Jr. (voice of Kanan Jarrus), and is an awesome synopsis of all of Season 1. This is exclusive to Blu-ray and DVD, and is really well done. The clips were painstakingly edited, and are an excellent recap as you gear up for Season 2. Rebels Season 2: A Look Ahead: This is also exclusive to Blu-ray and DVD, and features Dave Filloni providing major hints as to what we can expect from the crew of each member of the Ghost in Season 2. He even discusses Ashoka and Vader’s relationship, and there are many new clips. Definitely a must see! Rebels Recon: All the episodes from StarWars.com that premiered after each episode of Rebels are included as well. You can find these behind the scenes features online, but it’s nice to have them all in one place; they are more convenient to watch on the disk after you’ve seen the episode. The four Rebels shorts that debut before Season one are also included. Again, it’s nice to have everything together (and those shorts are canonical too). It really is a top notch Blu-ray set, with all of the features you would want from Blu-ray set. There are plenty of hours of Star Wars Rebels enjoyment coming your way through this Season 1 set. If you are a fan of this series, this is a great buy for you. Note: Special thanks to Disney Home Video Entertainment for the advanced copy to review.